This new edition of the popular and market-leading Diabetes in Old Age features up-to-date and comprehensive information about the key aspects of managing older people with diabetes, predominantly type 2 diabetes. 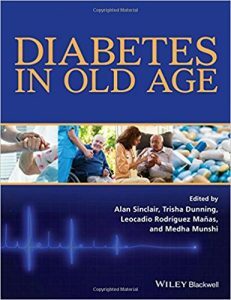 With a strong evidence-based focus throughout, the entire range of issues surrounding diabetes and its many complications are covered, each with a clear focus on how they relate directly to the older patient. Varying approaches to optimizing diabetes care in the community, primary care and secondary care health care arenas are presented, and the importance of comprehensive functional assessment is emphasized. Coverage of areas unique to an ageing population of older people with diabetes such as falls management, frailty and sarcopenia, and cognitive dysfunction form a key cornerstone of the book. In every chapter, best practice points and key learning outcomes are provided, as well as published evidence bases for each major conclusion. Diabetes in Old Age, 4th edition is essential reading for diabetologists and endocrinologists, diabetes specialist nurses, primary care physicians, general physicians and geriatricians, podiatrists and dieticians with an interest in diabetes, as well as all health professionals engaged in the delivery of diabetes care to older people.